Carlo (1997) music for strings and sampler — Excerpts only Brett Dean Sydney Symphony, The Song Company, Marin Alsop 8 mins, 20 sec. Recorded/performed at: Sydney Opera House, on 1987. Elena Kats-Chernin Sydney Symphony, Hiroyuki Iwaki 4 mins, 8 sec. Irkanda IV (1961) for solo violin, strings & percussion — Excerpts only Peter Sculthorpe Sydney Symphony, Stuart Challender 6 mins, 58 sec. Contents note: Carlo (excerpts) / Brett Dean -- Irkanda IV (excerpts) / Peter Sculthorpe -- Stairs (excerpts) / Elena Kats-Chernin. Capture session: Carlo recorded live in concert ; Irkanda IV recorded at Sydney Town Hall in 1989 ; Stairs recorded at Sydney Opera House Concert Hall. Performers: Sydney Symphony ; Marin Alsop (conductor: Carlo) ; The Song Company (Carlo) ; Stuart Challender (conductor: Irkanda IV) ; Hiroyuki Iwaki (conductor: Stairs). Score: Stairs : for symphony orchestra / E. Kats-Chernin. 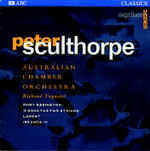 CD: Peter Sculthorpe / Australian Chamber Orchestra. Score: Carlo : music for strings, sampler and tape / Brett Dean. 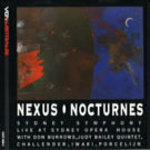 CD: Nexus, Nocturnes / Sydney Symphony Orchestra. CD: Chamber music from Australia / Peter Sculthorpe.